True Love Comes in Many Shapes! February's Bonus Pack + $100 Free Chip! They say all you need is love – but we at Uptown know a couple of massive bonuses and a $100 Cupid’s Free Chip wouldn’t hurt this February! 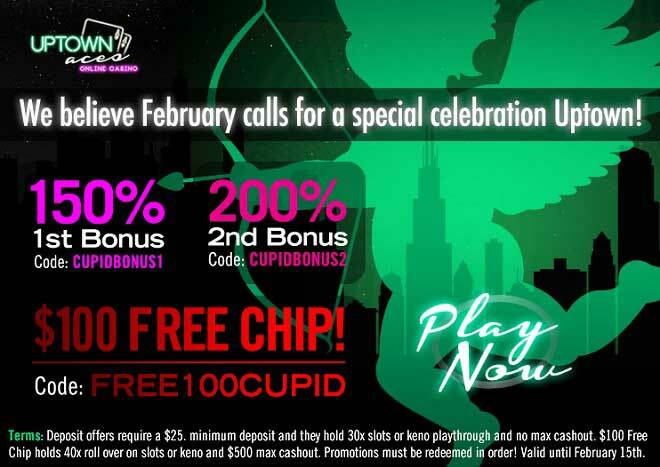 True love comes in many shapes and forms – and the celebration of this feeling is even more special Uptown when you know there’s a 1st 150% Match, a 2nd 200% Bonus and a $100 Cupid’s Free Spin waiting for you! Celebrate Valentine’s Uptown this year and you’ll be treated to more that lovely wins! Deposit a $25 minimum before February 15th and enjoy two huge bonuses and a $100 Free Chip! Deposit offers require a $25. minimum deposit and they hold 30x slots or keno playthrough and no max cashout. $100 Free Chip holds 40x roll over on slots or keno and $500 max cashout. Promotions must be redeemed in order! Valid until February 15th.